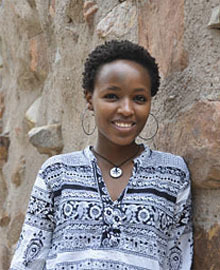 Nash Mepukori is a rising senior studying Global Health and International Comparative Studies. She is interested in the ways in which narratives around Female Genital Cutting are morphing in light of anti-FGC interventions. This summer, she will work with the Maasai community in Samburu, Kenya to collect narratives about community members’ understandings of Female Genital Cutting with regard to the Alternative Rites of Passage (ARP) intervention proposed by AMREF Health Africa. The ARP model advocates for the community to maintain the rites and ceremonies around female circumcision while getting rid of the cut. Upon returning to Duke, Mepukori plans to weave the results of this research into a senior thesis paper within the Global Health department.